Put that cynical look away, because the critics were right. 28 Weeks Later really is a sequel that delivers, that expands on the original, and in many ways even surpasses it. 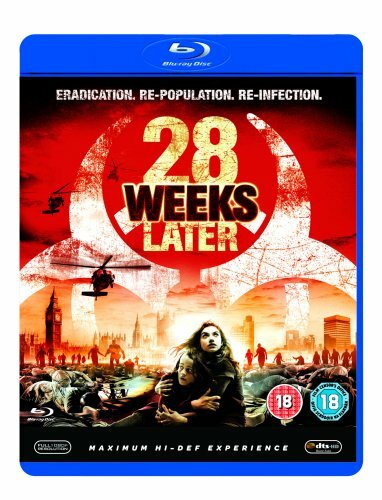 Faithful in many ways to the enjoyable, if derivative, 28 Weeks Later, this sequel sees original director Danny Boyle (who went off to make Sunshine instead) replaced by Juan Carlos Fresnadillo behind the camera (director of the excellent Spanish film Intacto). And Fresnadillo is an inspired choice, putting together a film that’s not bereft of flaws of its own, but one that proves to be an ambitious and surprisingly thought-provoking follow-up. Many of the building blocks are the same. Primarily set over six months after the Rage virus engulfed Britain, turning many of its inhabitants into deadly zombie-esque creatures in the process, the film this time though sees the American military arrive to help sort things out. Only things quickly go wrong, allowing Fresnadillo to mould a pacey, exciting and desperately enjoyable action carnival, that’s got a little more under the surface. Grounded by Robert Carlyle as one of the survivors of the virus, replete with his kids in tow, 28 Weeks Later skilfully navigates the labyrinth of sequel hell and really, really delivers. What’s more, it opens up the enticing possibility of a further sequel, and on the evidence of this film, that’s a very welcome thought.